In Part One we looked at how we can use Adobe Dynamic Link to move clips back and forth between Adobe Premiere Pro and After Effects, just as if they were one application. In this part we’ll look at how to import projects into After Effects, and also how to move from After Effects to Premiere Pro. One thing we didn’t look at in Part One is that you don’t always have to be so formal in transferring clips from Adobe Premiere Pro to After Effects and vice versa. You can simply copy the desired clips in one application and paste in the other. You can also drag and drop clips, though this is trickier if you have maximized both applications. There’s nothing special about copy-paste, except it’s a faster way of working if you’re going to have to move back and forth often. If you want to finish your project in After Effects, it doesn’t make much sense to work with one clip at a time with Dynamic Link. What will happen is you will create several dynamically linked compositions, each with their own filenames and metadata. For large projects, it quickly becomes tedious to keep track of all these elements and changes. The simpler way to handle this is lock your edit in Premiere Pro to the best of your ability, and decide to transfer the entire project into After Effects. The key difference here is that the clips are no longer dynamically linked. If you want to go back and forth, you’ll have to do it manually. Let’s see how this works. To import a Premiere Pro project (*.prproj) go to File > Import > Adobe Premiere Pro Project… and select the project you want to import. Ideally, you’d only want to import your main sequence. If you have multiple versions of your edit, you don’t want to import all of them by choosing ‘All Sequences’ under Select Sequence. Nested sequences are preserved. If you only select to import one single nested sequence, After Effects will import any sequences it contains as well, automatically. All clips are imported to the project. To keep things simple, try to mix down your audio into one track. It’s not mandatory, but it will eliminate most audio errors. To hear audio while previewing, choose RAM Preview. Audio level keyframes are preserved on import. Titles and color corrections applied in Premiere Pro don’t get imported in After Effects, so if you’re finishing in AE make sure you schedule these tasks to be completed in After Effects. There’s nothing more frustrating than spending hours tweaking effects in Premiere Pro that won’t show up in After Effects. Understand the limitations of moving a complex project from one application to another, and you’ll be okay. I have successfully transferred an entire movie project this way, and it’s a great workflow when you know what you’re doing. If you have loads of tracks in Premiere Pro, your After Effects timeline will look unmanageable. This is unavoidable on large projects. Use nested compositions within After Effects to keep you main timeline neat and easy to access. It all comes down to good habits and logical organization. Don’t get lazy. You might believe you are on top of everything, but if you have to revisit your project at a future date, you won’t remember squat without a system to fall back on. If you have existing dynamically linked clips running between Premiere Pro and After Effects, you can’t import that *.prproj file using the method shown above. Can’t have your cake and eat it too, you know. If you look at the menu for Import shown above, you’ll see there’s an option called ‘File…’ (File > Import > File…). If you use this to import a Premiere Pro *.prproj file into After Effects, you will be creating a dynamic link, and the entire project will appear as one big clip, without access to its individual clips, transitions, etc. 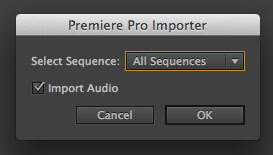 The same happens if you use File > Adobe Dynamic Link > Import Premiere Pro Sequence… (see image below). The entire sequence appears as one clip, without the corresponding shots. Why would you need one chunky clip? Well, if you just want to add effects to the entire sequence in one go, like a grade, a vignette, a title over, etc., this is one super easy method to do it. If you’re editing in ‘bite-sized’ sequences, you can create multiple sequences and nest them in Premiere Pro, and just send out individual sequences for VFX work in After Effects. I always prefer to keep my options open, and would avoid working this way, but lets not forget the major advantage. This chunky clip is dynamically linked, so any changes you make will show up immediately in your Premiere Pro project. There’s no absolute right or wrong here. Adobe gives you as many options as you want (probably a lot more than you will ever need). We’ve already looked at the second option in the last section. The first option, i.e., File > Adobe Dynamic Link > New Premiere Pro Sequence… opens Premiere Pro in which you are prompted to choose your settings for a new sequence. This sequence is blank without much to do. The only thing is, this sequence is now dynamically linked to After Effects. One good example of its utility is if you’re creating pure motion graphics work in AE. The motion graphics artist finishes his/her job, and then creates a Premiere Pro sequence with the composition in it so you can continue editing. Any revisions will automatically show up in your Premiere Pro timeline. See? Every feature has a usage scenario in which it makes sense. These options don’t exist by accident, you know. A rendered master from After Effects can be used to grade in Speedgrade or create deliverables in Premiere Pro. Exporting a project from After Effects to Premiere Pro has major drawbacks, the most important of which is you lose the effects you have created in After Effects. Only those features supported by Dynamic Link (look at the above charts) will be transferred. So, how does one use this feature? You could render clips with effects within After Effects and replace them. Once all your work has been rendered to an intermediate format (Prores, DNxHD, TIFF, DPX, etc.) you don’t have to worry about any effects that have to be carried back. I personally try to avoid rendering as much as possible. With Adobe’s native workflow, it is so easy to plan your project so you only have to render at the finishing stage, or at least at critical points. Creating new clips (which also have to be tagged for metadata, versioned properly and copied with your project) just because one is lazy is being penny wise, pound foolish. All clips are imported into Premiere Pro in the correct order. Finish in Premiere Pro – small projects with minimal AE work. Use Dynamic Link for individual clips and be done. Finish in After Effects – large projects with lots of titles, graphics, effects, etc. Great for mastering top quality image sequences. Finish in Speedgrade – Get your project ‘almost finished’ in After Effects, render out the clips with effects, import back into Premiere Pro and use the Premiere Pro to Speedgrade Dynamic Link functionality to carry your project into Speedgrade. 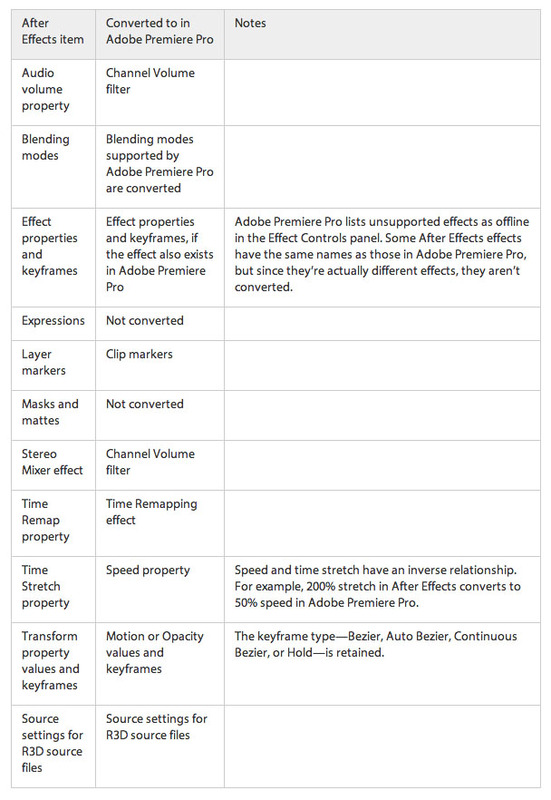 I hope this fast but detailed coverage of the Premiere Pro to After Effects workflow has given you enough ideas on how you should go about your own projects. No two projects are alike, and the only thing that matters in the end is the quality of your finished product.